Antonio Citterio Patricia Viel has transformed Marazzi’s showroom in the heart of Milan’s design quarter. Pinned to the aura of design excellence associated with the location, the new display spaces rearticulate the identity of Marazzi’s brand as the international leader in design and production of ceramic tiles. 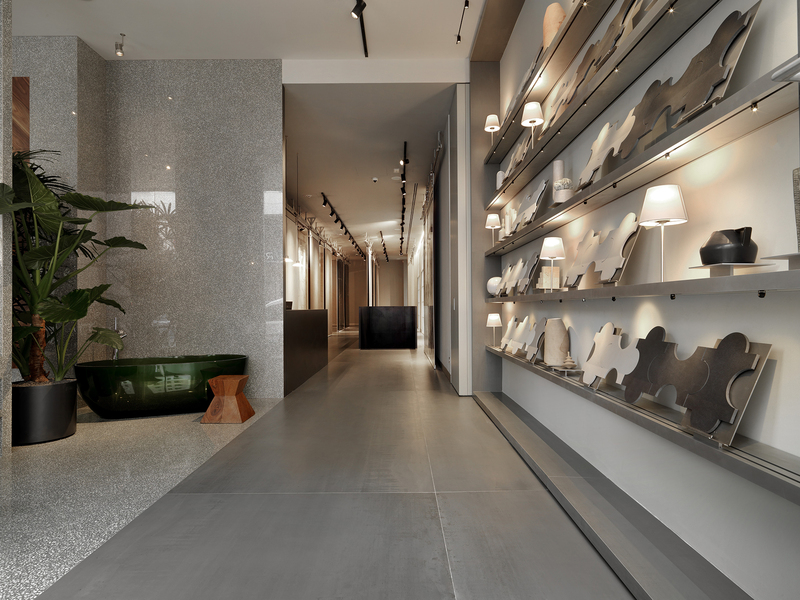 The showroom’s areas are designed as a “wunderkammer” of colors and materials where the ceramics and the interiors complement and reinforce each other to create a one-of-a-kind visual effect. A smooth sequence of spaces reveal a range of ceramic creations at different scales. Thematic rooms display shelves of individually illuminated items in a museum-like fashion, seamlessly transitioning into the areas where large slabs are hung from floor to ceiling. At the entrance to the showroom, a preview of the Grand Wood Tarsia collection, designed by Antonio Citterio Patricia Viel, is exhibited. With a gentle optical illusion, the collection highlights the amazing decorative potential of wood, employing the ancient art of inlay on the large-scale stoneware slab.